Gerboise Bleue ("blue jerboa") was the name of the first French nuclear test. It was an atomic bomb detonated in the middle of the Algerian Sahara desert on 13 February 1960, during the Algerian War (1954-62). General Pierre Marie Gallois was instrumental in the endeavour, and earned the nickname of père de la bombe A ("father of the A-bomb"). Gerboise is the jerboa, a desert rodent, while blue is the first color of the French tricolor flag. So the second and third bombs were named respectively "white" (Gerboise Blanche) and "red" (Gerboise Rouge). With Gerboise Bleue, France became the fourth nuclear power, after the United States, the USSR, and the United Kingdom. Gerboise Bleue was by far the largest first test bomb up to that date, larger than the American "Trinity" (20 kt), the Soviet "RDS-1" (22 kt), or the British "Hurricane" (25 kt). The yield was 70 kilotons, bigger than these three bombs put together. The second most powerful first-test bomb was "Chagai-I", detonated by Pakistan in 1998, at 40 kilotons. 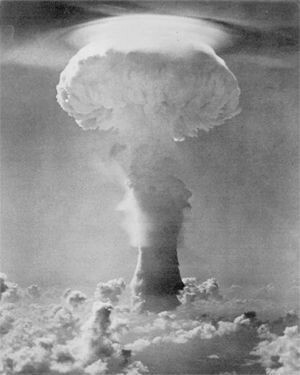 In comparison, Fat Man, the Nagasaki bomb, was 22 kilotons, one-third as powerful. Annotated bibliography on the French nuclear weapons program from the Alsos Digital Library for Nuclear Issues.